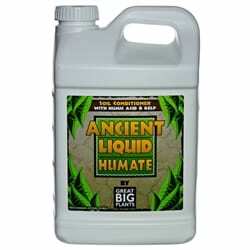 Ancient Liquid Humate soil conditioner is a combination of liquid humic and fulvic acids and kelp. We extract our humic and fulvic acids from long decayed plant matter. We add kelp that is hand harvested from select cold water kelp beds in the North Atlantic. The result is a highly bio available source of carbon, potash and trace amounts of other minor and major nutrients. Encourages root growth and creates a healthy root system. Increases bio-available carbon and other bio-stimulants in the root zone. Increases carbon-to-nitrogen ratio; improves nitrogen uptake. Increases uptake of other key nutrients; improves fertilizer efficiency. Improves soil structure and water holding capacity. Increases population of beneficial microbes. Acts as a pH buffer, and improves nutrient availability in pH poor soils. Kelp provides natural plant growth hormones. How Does Liquid Humate Work? 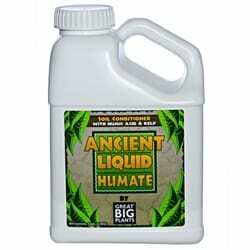 Ancient Liquid Humate is designed to provide the benefits of humic and fulvic acids and kelp to the root zone in the most bioavailable form. 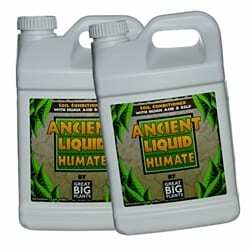 Humic Acids are the soluble portion of fully decomposed plant and animal matter. Numerous university studies show that humic acids have positive effects on plants by improving soil structure and fertility and by improving nutrient uptake and root architecture. 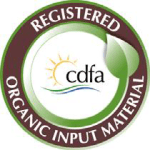 Ancient Liquid Humate contains 12% humic acids (A&L Western method) or 6% when using the California Department of Food and Agriculture measurement method. This is six times the level of bioavailable humic acids found in our natural compost extract products. The substantial amount of humic acids improves all nutrient uptake and especially nitrogen due to the increased carbon to nitrogen ratio (C:N). We add soluble kelp in order to provide potassium (2%), micronutrients, plant growth hormones and to act as a food source for soil microorganisms. Potassium is one of the most important macronutrients for plants and trees effecting water and sugar transport. Citrus trees in particular have been shown to be sensitive to adequate potassium levels and will benefit from the addition of Ancient Liquid Humate at the normal feeding intervals. Our liquid humic acid is used on dozens of golf courses to boost turf growth. Bio-available carbon helps improve nitrogen uptake which encourages greener, healthier turf. Supplement tree fertilizers with Ancient Liquid Humate to improve nutrient uptake and encourage fruit development. Mix 1 cup (8 fl. oz) of Ancient Liquid Humate with 5 cups of water. Apply 1 pint of mixture per plant or shrub and 1 quart of mixture per tree. Apply every 2 months. Hose-end sprayer – apply at 1 quart of Ancient Liquid Humate to cover 1,000 square feet of turf. Apply monthly during growing season. 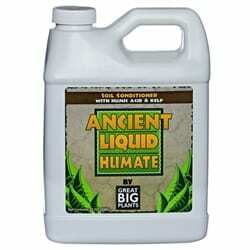 Ancient Liquid Humate has a high pH before dilution. Do not mix directly with acid solutions.